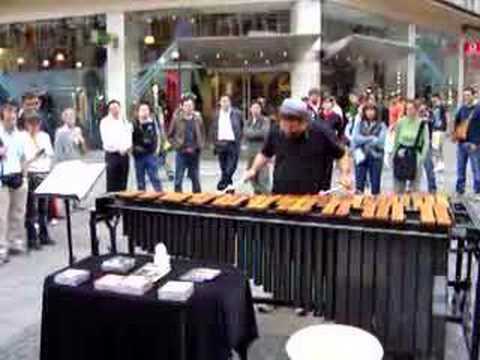 Alex Jacobowitz (born 19 May 1960 in New York) is a classically-trained street performer who plays the marimba and xylophone. During the 1980s and 1990s he played in New York City, including at the Lincoln Center's "Meet the Artist" program, Yeshiva University, Zabar´s, Central Park, the 84th Street Synagogue, International House, the New York Hilton, Metropolitan Museum of Art, and Coney Island's "Sideshows by the Seashore". He was an Official Street Performer at the South Street Seaport in Lower Manhattan, a member of Musicians Under New York, and Young Audiences of Rochester. He has performed at Arts Councils and Imagination Celebrations throughout New York State. He has performed on Entertainment Tonight, and has been an artist-in-residence at Artpark (New York) and Holland Village (Japan). In 1991, he moved to Europe, mainly performing in Germany, and living in Goerlitz. Jacobowitz performed classic and Jewish traditional music on German television (ARD, ZDF, Third Programmes), and occasionally in Hungary, Israel, Italy, Luxembourg, South Korea, Poland, Portugal, Switzerland, Russia and Ukraine. In 2006, he was invited to perform at the Busker's Festival in Ferrara, Italy. He is the recipient of a Meet the Composer award. His Art of Xylos CD was released in 2002 by Sony-BMG under the Arte Nova label, and was nominated for the Echo Prize under the crossover category. He won competitions in Lucerne (1994), Ludwigsburg (2004) and Osnabrück (2007).